Sumac tree growing shrub‎ or tree of the genus Rhus also known as Sumach, Sumac tree perennial deciduous or evergreen plant, used for the edible and fragrant fruits or as medical but mostly used as ornamental plant, can grow in temperate, subtropical, mediterranean climate and growing in hardiness zone 5-10. Leaves color green in elliptic shape grow in pinnate structure. Flower color can be: yellow, white, small flowers grow on stalk in clusters. 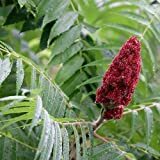 What can be done with big quantities of Sumac tree fruits & seeds? How long does it take to bear fruit & seeds?